Lubok (Лубок, from луб, bark of linden) is a traditional Russian woodcut print. Originated in Europe, lubok became a popular media in the 17-18th century and could be described as early comics. Usually, lubok prints depicted historical, religious, comical, or fairy tale scenes with some text. Often lubok prints were hand painted. 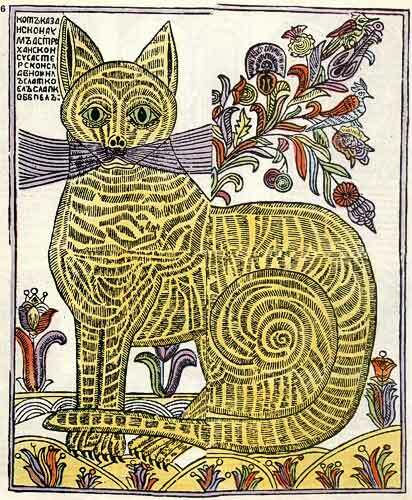 Just like on the Web, one of the most popular characters of lubok was the Cat, usually described as “The Cat of Kazan, the Mind of Astrakhan, the Wisdom of Siberia” that sounded somewhat like title of the Russians tsars (We, by the grace of God, Emperor and Autocrat of all the Russians, of Moscow, Kiev, Vladimir, Novgorod, Tsar of Kazan, Tsar of Astrakhan, Tsar of Poland, Tsar of Siberia, etc; The Cat is sometimes considered to be a satire on the Russian tsars and particularly on Peter the Great). 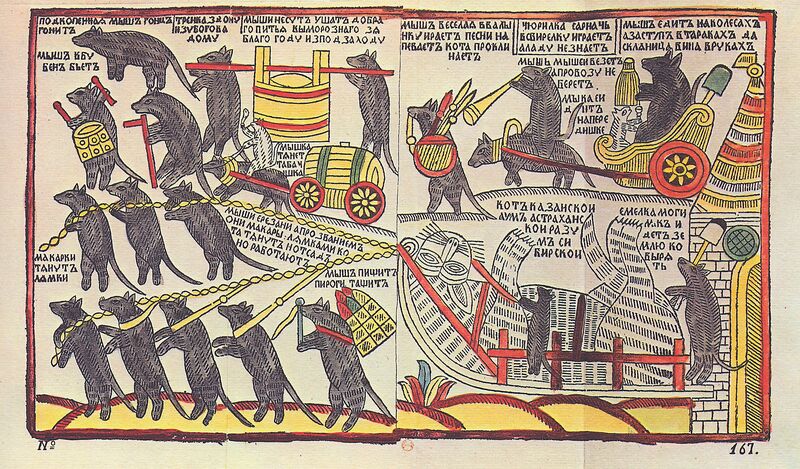 Another popular “comic strip” is a carnival scene of the mice burying the Cat (mentioned in some Russian classic literature including Alexander Pushkin’s The Captain’s Daughter). Some of the mice are labeled with absurd rhymed inscriptions mentioning their names and occupations. 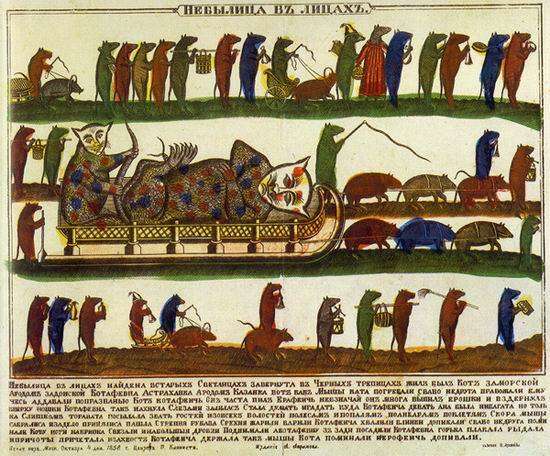 Fantastic inverted world where weak creatures bury the strong enemy was a common for European folk culture, but lubok artists add unique Russian environment. There are various interpretations of such lubok scenes usually mentioning social satire and the skomorokh tradition of wandering actors (Russian version of mummers/harlequins). Brightly, roughly colored grotesque pictures are being rediscovered during the recent decades and inspired several animation shorts. 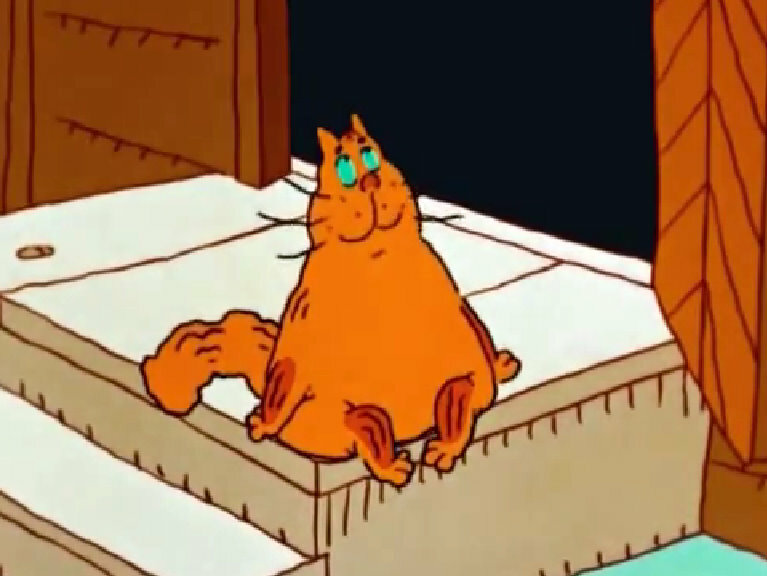 One of the best known is Alexander Guriev’s Cat and Company (Soyuzmultfilm). Shot during the late perestroyka, this witty cartoon skillfully incorporates bold colors and minimalist style of lubok. The kind-hearted cat does not want to catch mice and dreams about learning to fly (thus becoming free). 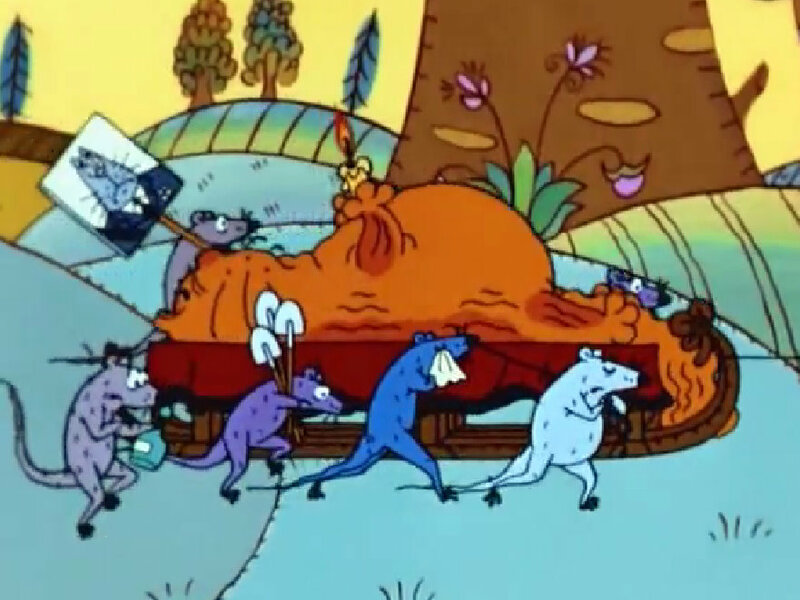 When he is locked by his mistress, all mice gather to help him by arranging a funeral procession that mimics bombastic funerals of the Soviet leaders during the early 1980s (Brezhnev died in 1982, Andropov in 1984, Chernenko in 1985). 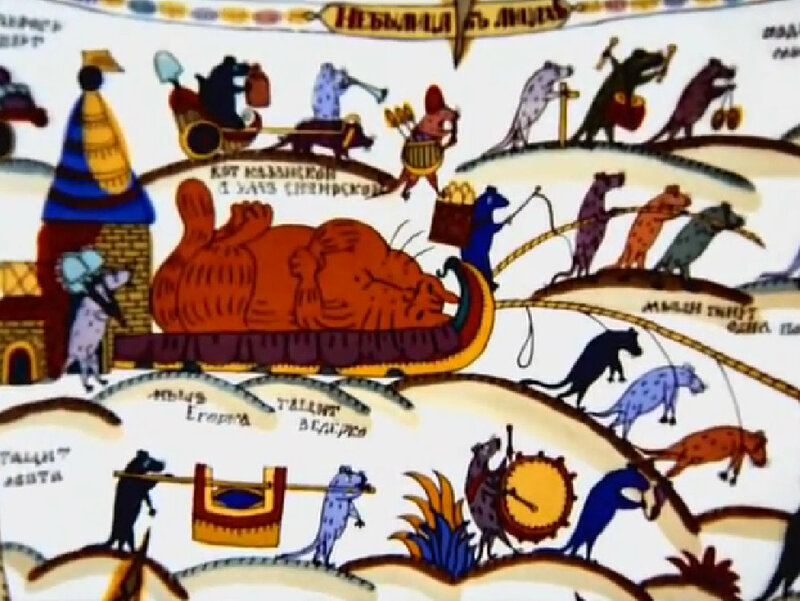 Note one of the mice holding a poster depicting the Cat in a suit with numerous medals, satire on Brezhnev and his passion to decorate himself. Alexander Guriev, Кот и компания (Cat and Company), 1990 No knowledge of Russian is required N.B. Modern animation artist Andrey Kuznetsov created a gallery of contemporary lubok interpreting popular movies and cartoons, including Cheburashka (in Russian). Some of them are translated here.